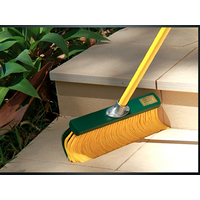 Easily extendable with various accessories. 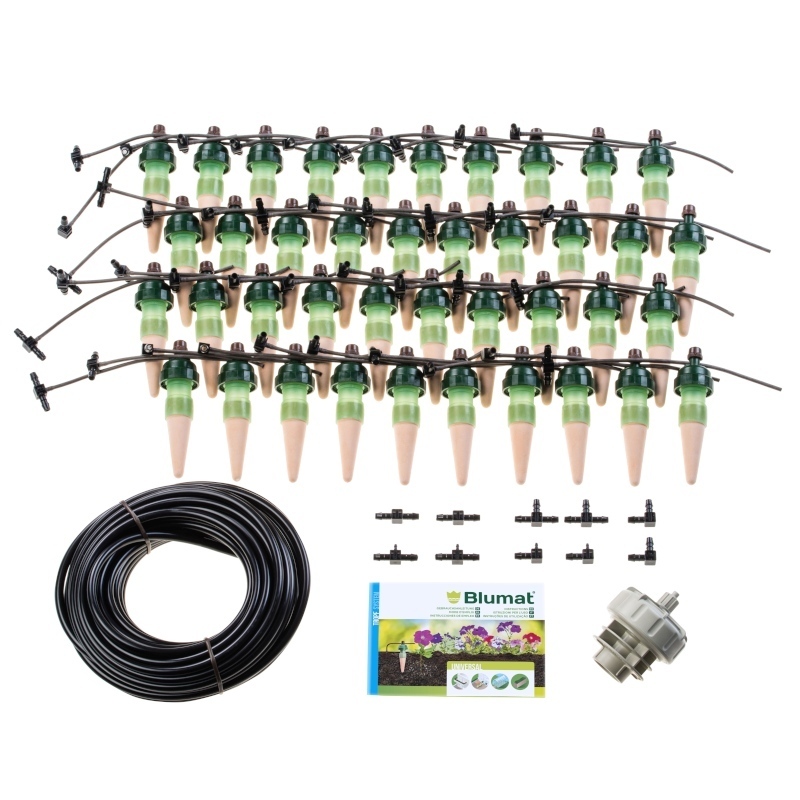 The Blumat Drip system is a sensor and drip feed system, both at the same time. 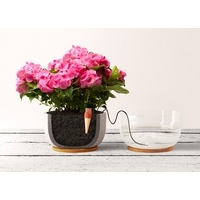 The slow and measured release of water enables plants to receive water which has been allowed to stand for a while at a temperature which is in keeping with the enviroment. 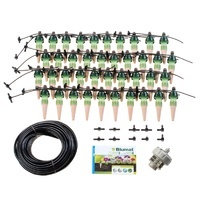 This ensures both profuse flowerage as well as healthy plant growth. 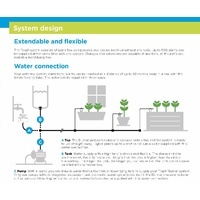 Conventional watering systems release water at intervals which are automatically scheduled via computer. 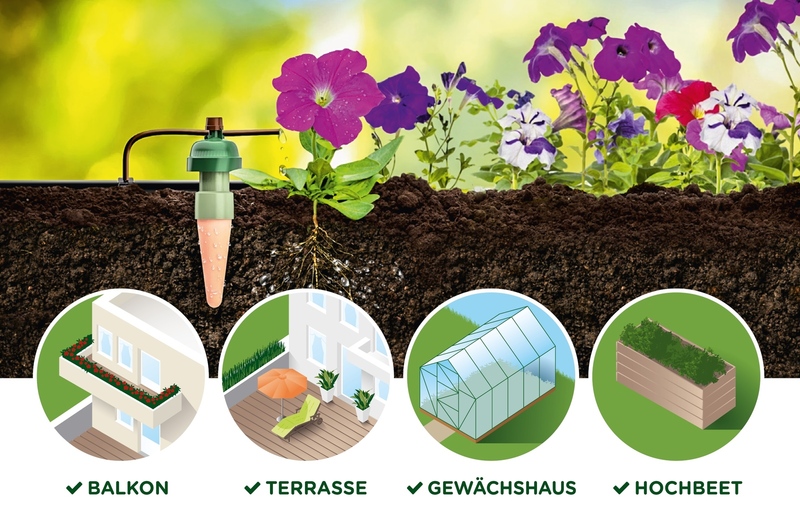 What they do not take into consideration, is the amount of sunshine, the current moisture of the soil or the varying water requirements of individual plants. YOU CAN NOW SAVE TIME, MONEY AND RESOURCES! 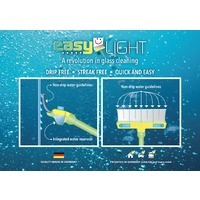 Save yourself the bother of daily watering and unnecessary water consumption. 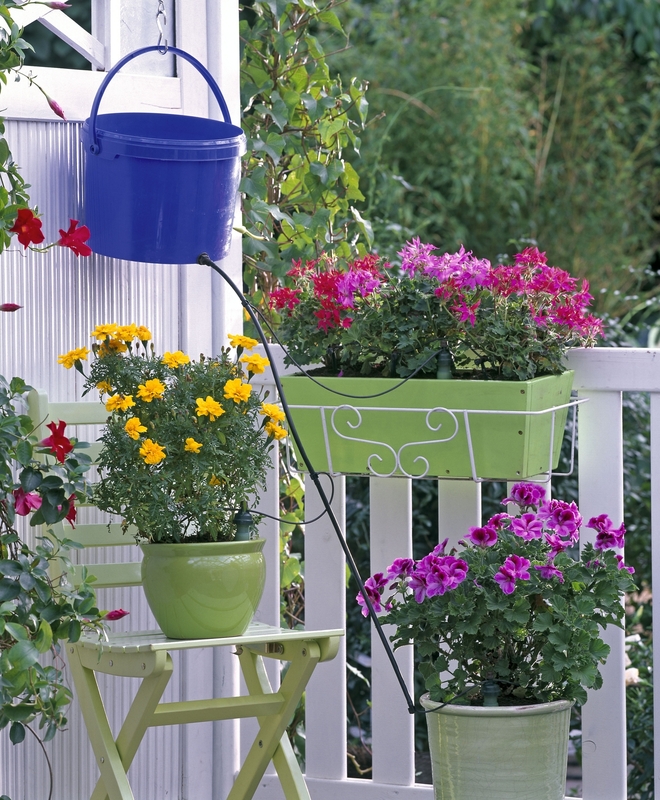 Statistics indicate that on average 100 litres of water are wasted over the summer months on watering flowerboxes on the balcony and 200 excess litres on watering hanging basket plants. 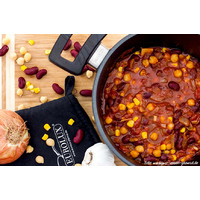 350 excess litres are used on tomatoes. 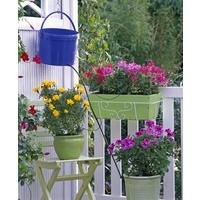 You will save your plants from the negative effects of incorrect watering and overwatering. 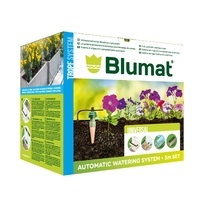 Blumat systems automatically control the watering process so you can go off on holiday in the safe knowledge that your plants will be watered Blumat systems. 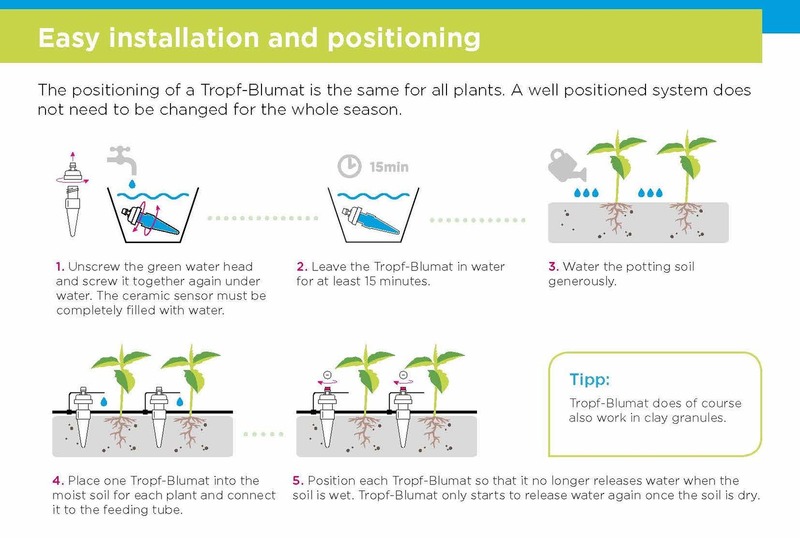 For watering planter boxes, use the rule of thumb: 4 drip locations (Tropf-Blumat) per 100 cm box length (box width- 20 cm), 3 drippers for 80 cm. 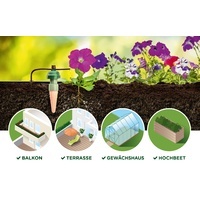 For wider troughs (such as 100x40 cm), usually 6-7 Tropf-Blumat are enough, depending on the size of the plants – also see bed plantings. 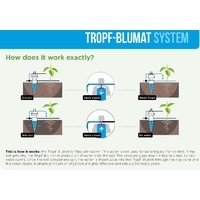 For watering in pots, every plant / every pot should have 1 Tropf-Blumat. 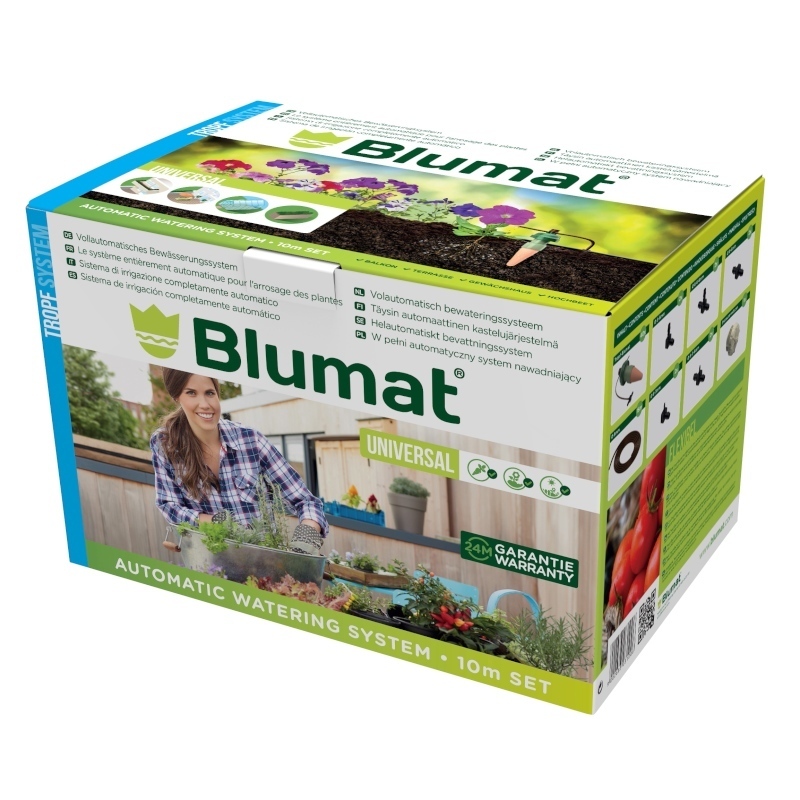 According to the pot size, 1 Tropf-Blumat is enough for pots up to ca. 20 cm in diameter, for pots up to 40 cm use 2 Tropf-Blumat, up to 50 cm 3 Tropf-Blumat. 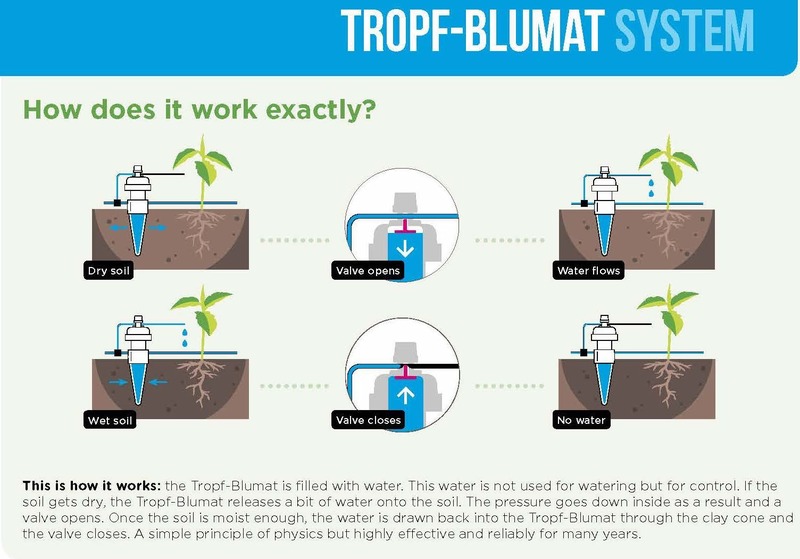 The size of the plant is also an important factor and sometimes the needs of a particular plant species plays a role when deciding on the number of Tropf-Blumat needed. 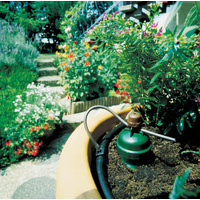 Large Containers such as planting tubs, for example, should often have fewer drippers in order to avoid overwatering. 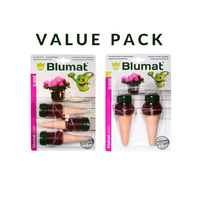 For bed plantings, 2 plants (the size of typical summer flowers such as geraniums) require 1 Tropf-Blumat (plant spacing ca. 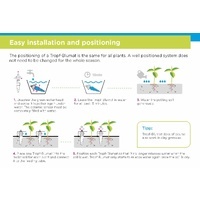 20-22 cm), when planted closer together (about 15 cm), 1 Tropf-Blumat is enough for a group of 3 plants. 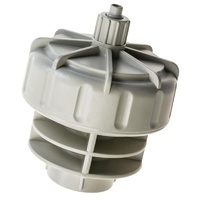 The connection onto the elevated tank (spigot with hose) should be mounted towards the bottom of the tank, about 5 cm above the tank floor (12 mm bore hole). The elevation of the tank should be at least 70 cm above the watering level (top of pot) to the bottom of the tank, in order to produce the necessary minimum pressure. 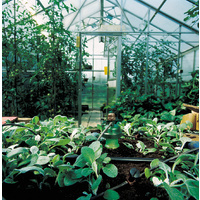 Overly low pressure can result in clogging of the tubing. 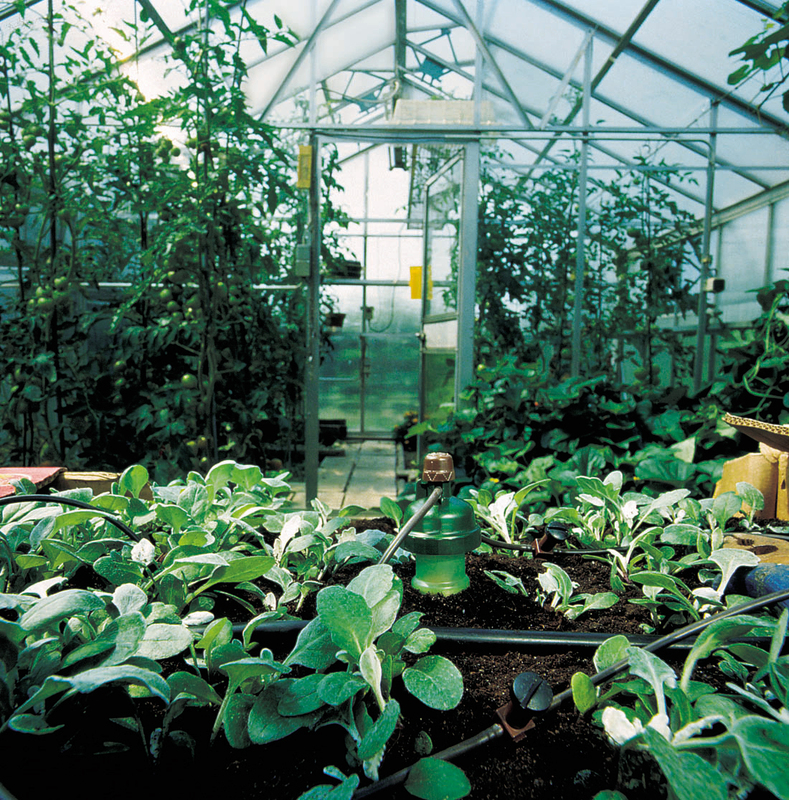 The tank can be purchased at a local hardware store to meet individual needs. It should be impenetrable to light and should be cleaned occasionally. 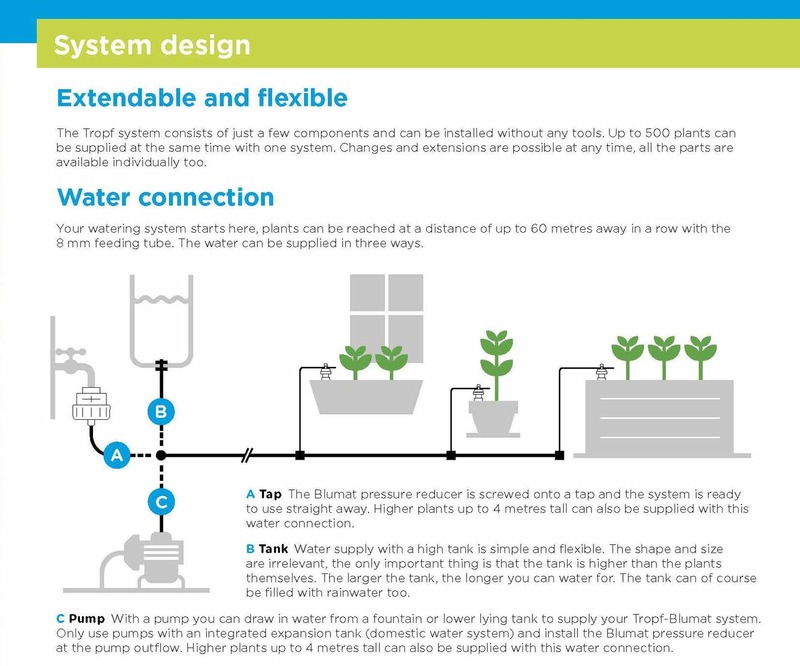 The 8 mm-water supply tubing should be placed near the plants on top of the pots or along the top of the planter boxes; for each desired Tropf-Blumat location, the tubing is cut and a t-connector is inserted into the two ends of tubing (for the last Tropf-Blumat at the end of the tubing, use a end piece instead of a t-connector). 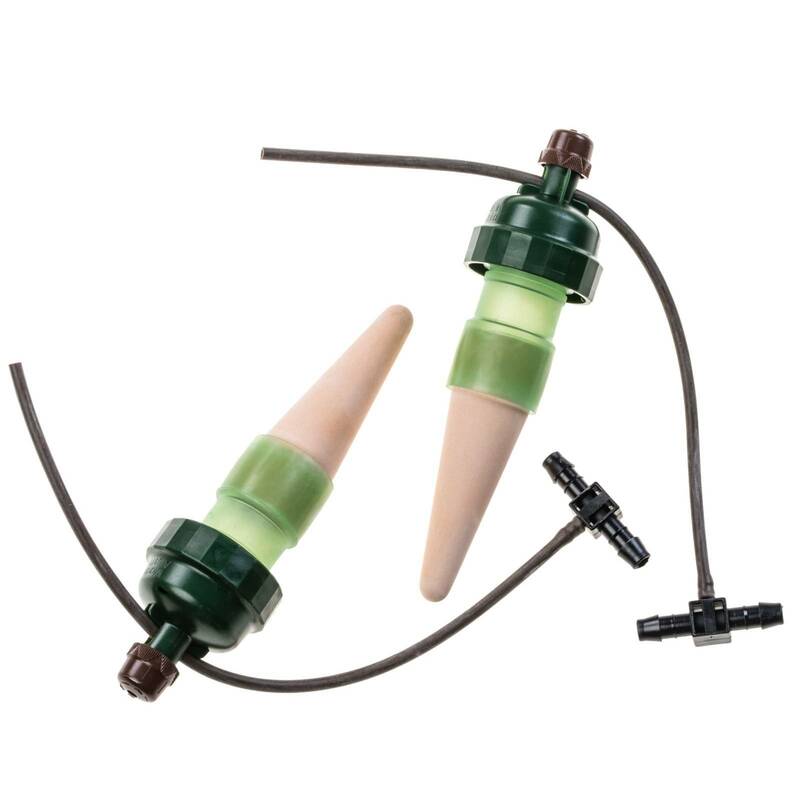 The tubing can be mounted using support pins which are an accessory to the system, or alternatively, wire fasteners or similar clamps can be used.